These lists of terms or keywords help your users to sort through content on your website by sorting that content into specific categories. Content tagged with these keywords can then be searched, sorted, and filtered. You choose the categories that are most meaningful to your users and classify your content to make it findable. 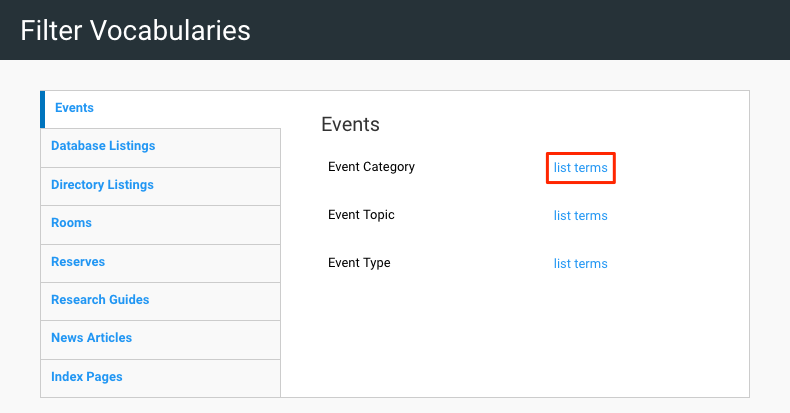 Filter vocabularies lists are used in the following Stacks Signature Tools: Events Management, Database Listings, Room Bookings, Research Guides, News Articles, and Index pages. For example, you might choose to create a relationship between "CompSci 1015" and "Summer Semester 2016"